From La Machi we are committed to get good causes spread in every corner of the world. Therefore, we know that Digital Marketing is a key ally to get to know our audience and understand what they need, wherever they are. This same advantage that technology gives us is also a great challenge to be updated in the face of changes and constant transformations. 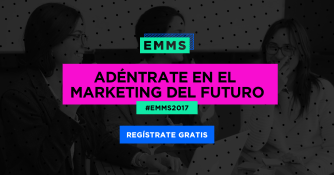 Therefore, we decided to be EMMS 2017 partners, the tenth edition of one of the most disruptive events in the digital world. It is an online and free meeting organized by Doppler Email Marketing during October the 19th and the 20th. It is designed for all lovers of Digital Marketing, whether entrepreneurs without experience or professionals with advanced knowledge. The event will have the testimony of different referents of the digital world. They will share their experiences and provide some tips for attendees to put into practice in their own projects. Meet the speakers and review the time schedule according to your geographical area. Among some of the topics that will be developed on the first day, there will be tips to improve sales in social networks, review techniques of Digital Marketin to “take off” a startup and explore the relationship of brands with users. During the second day, several key areas of current Marketing will be deepened: Shopping Experience, design of business models focused on Customer Experience and some keys to reach the audience at the right time in the hands of Marketing Automation.